I don’t have PayPal account. Can I pay with my credit card/check? Is this product approved by the FDA? E-Puffer electronic cigarette (or “e-cig “/ "e-cigarette") is an alternative to smoked tobacco products, such as cigarettes, cigars, or pipes. It is a battery-powered device that provides inhaled doses of nicotine by delivering a vaporized nicotine solution. In addition to nicotine delivery, this vapor also provides a flavor and physical sensation similar to that of inhaled tobacco smoke, while no tobacco, smoke, or combustion is actually involved in its operation. The ingredients of e-liquid (the juice that is used in our electronic cigarette cartridges) are: Nicotine Liquid, Propylene Glycol, Acetyl Pyrazine, Damascenone and flavor. Most of the ingredients could be found in many fruits and vegetables and are known to be safe for humans. 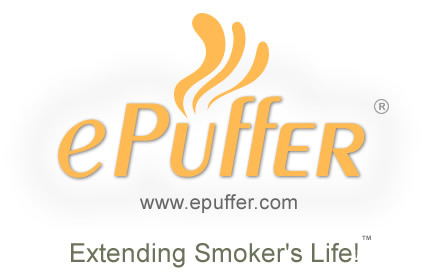 E-Puffer has helped many people who wanted to quit, cut down or simply smoke healthier. Our product is unique and totally different from nicotine gums, patches or any other solutions that are available on the market today. On average, it takes about 5 months for one to move down from High to Zero nicotine intake and once you are at zero nicotine, it is up to you how you want to handle your habit. You can simply stop (no more nicotine cravings), or continue your habit smoking zero nicotine cartridges when you feel like it. Every kit* includes two batteries of the same capacity**. Recharge one while another is being used. One fully charged battery will last for smoking of one cartridge. The average battery lifespan is 350-400 recharge cycles. Average life per charge varies from 100 to 250 puffs***. ** Magnum Starter and Deluxe kits have one Mini and one High capacity batteries. The original ePuffer EAZE MAGNUM Electronic Cigarette and COHITA disposable Electronic Cigar appeared on “The Doctors” count down for the Top 10 Health Trends of 2009! The Doctors shared a positive opinion of the product, suggesting that it was a much healthier alternative for current smokers. To test the effectiveness and " feel " of the product they had a volunteer try the ePuffer EAZE Magnum electronic cigarette. Being so satisfied with the product she quit smoking regular cigarettes altogether, and that was only after 2 days of using the ePuffer EAZE MAGNUM electronic cigarette! She also stated that she would definitely suggest the product to her friends and family. Please refer to the chart below regarding size and weight of the e-cigarettes. Our cartridges and e-liquids are available in various flavors and densities for you to find the one that will match your smoking habits. Tobacco flavors: Premium Tobacco, State Express 555, Virginia/Brun, Mirabella/Marbello, Hilton, Ryan, Camel, Cigar/Cohita. Sweet/fruity flavors: Cherry, Coffee, Mint, Vanilla, Apple, Strawberry, Chocolate, Valerian. EAZE MAGNUM: We do not officially recommend refilling EAZE MAGNUM cartridges, as it is marketed as disposable cartridge, but many of our customers tried and successfully refilled Magnum cartridges. To refill the cartridge, pop the white rubber cap off and squeeze a few drops of e-liquid around the nicotine pad avoiding the center. Let the liquid absorb for 20-30 seconds and then you can smoke it again. We do not recommend refilling the same cartridge more than two times to preserve the original taste quality and vapor volume. If you already tasted the burnt (near the end of the cartridge life), this cartridge can’t be refilled. All the rest: Detach the cartridge from the atomizer and squeeze a few drops of liquid on the pad inside of the cartridge. Give it some time to absorb and make sure you did not overfill the cartridge. To preserve the original taste quality, we do not recommend refilling the same cartridge for more then 5 times. Please refer to the "Don't have a PayPal account?" section on the left hand side of the check out page and click the “Continue” link. It will transfer you to the credit card payment screen. You can also fill out the electronic check form. Please note that when e-check is used as the method of payment for your order, that payment must be cleared before any delivery will take place. Standard e-check clearance times are 3 - 5 days. The request was placed with FDA and now is being processed. It takes a while so the application currently has pending status and we are waiting for it to be approved. Customers must request an RMA authorization prior to returning any merchandise to ePuffer.com Authorization may be obtained using a contact us form. If your questions are not listed above, please click here to contact our Customer Service Team. In order to streamline support requests and better serve you, we utilize a support ticket system. Every support request is assigned a unique ticket number which you can use to track the progress and responses online. Please reopen tickets on reply to avoid miscommunication. For your reference we provide complete archives and history of all your support requests.